Clothes are not what come to mind when I first think of my eating disorder. Instead, there are the frozen vegetables that qualified for meals, the midnight trips to the kitchen to eat a nut (or two) when I felt like my heart was stopping, and the moment—a few days before being sent home from school for being too thin—when I stared at my naked body in the mirror and cried. Not because I felt fat, no, but because I finally realized I looked ill, yet couldn’t control my warped behaviors despite that recognition. I remember continuing to cry on the floor of my closet, which was filled with fun clothes that had long been untouched—totems of the healthy girl I once was. I remember calling my mother, who had been aware for a while that the cause of my dwindling figure was not as simple as a change in exercise and diet. I called her in the hopes that she’d have some magic words to ward off the bossy anorexia in my brain. She tried her best, but "best" has nothing on an illness that alters your brain chemistry and throws your body into perpetual starvation mode. In that mode, I had to use my meager energy wisely. Clothes that took any effort or made me stand out in any way became negligible. The goal was always to glide by, unnoticed. I operated—because that’s truly what it felt like—in dark skinny jeans and leggings, paired with Uniqlo heat tech shirts to keep my always freezing body warm. Going out with friends, a rarity then, became an effort in not shivering the night away—pretending to be healthy. My lifelong interest in fashion slumped off, discarded in that closet with the thrift-store gems and party outfits that I had acquired over the years. There was no need for those now, no place for them in a life that revolved around trips to the gym and rigorously monitoring my caloric intake. Despite an increase in awareness, anorexia is often misunderstood by others. Those of us who have suffered don’t wake up one morning pining to look like Gisele or to fit into the smallest sized jeans. Instead, the disease overtakes us a result of past traumas or a genetic predisposition to the illness—usually a bit of both. We endure it at first for the false feelings of control it provides, only to find that we’re soon completely out of control. There’s nothing pretty or ideal about it—it’s not chic, it’s not success, it’s not worthy of the pages of a fashion magazine. I never celebrated the way I looked in clothes then—clothes, as I mentioned, were an afterthought. Shopping was not suddenly more fun; it became a waste of time amongst my other priorities. Indulgence of any kind—be it in food or fashion—became shameful. I focused on taking up less space in the world, and nothing more. It was an extreme lesson, but one which taught me that no “goal weight” can really make a person feel better or love their reflection more in a dressing room. To achieve that, I realized that you have to work on the mess inside of you—untangle all that has built up over the years to convince you that you (and thus your body) are not good enough. A Cheryl Strayed quote comes to mind here: "Nobody will protect you from your suffering. You can't cry it away or eat it away or starve it away or walk it away or punch it away or even therapy it away. It's just there, and you have to survive it. You have to endure it. You have to live through it and love it and move on and be better for it and run as far as you can in the direction of your best and happiest dreams across the bridge that was built by your own desire to heal." Those words never felt more true to me than when I was sent off to a treatment center to start the long slog to recovery. I brought some of my favorite clothes with me—none of them purchased while I was sick—as inspiration. Slowly, as my nutrition revved up and my body shook itself out of starvation, I began to gravitate to those once-loved items again. The oversized sequin sweater from the ‘70s, the quirkily printed shirtdress, and the light-washed denim culottes that once were my mom’s. This was real style—real individuality—and it had everything over the languid look championed by my disorder. If you or someone you know is suffering from an eating disorder visit The National Eating Disorders Association or call their free, confidential helpline at 1-800-931-2237. 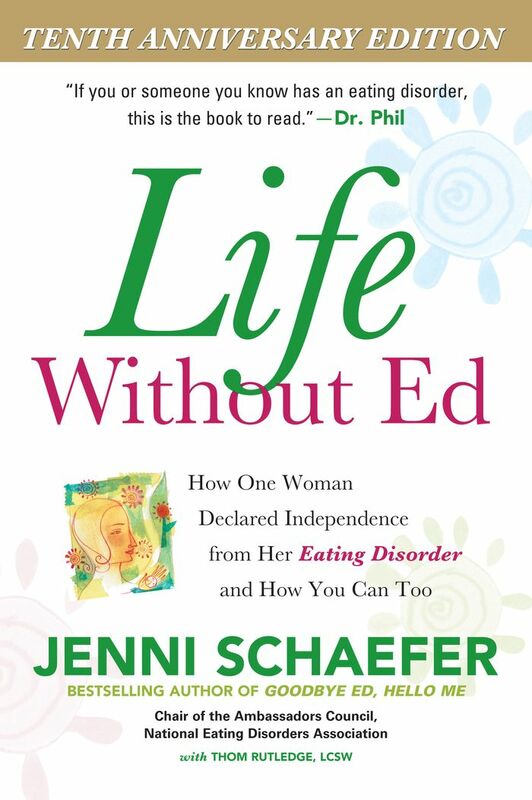 Other helpful resources include The Academy for Eating Disorders, Recovery Warriors and the below books. Can you relate at all to this editor's experience? Let us know in the comments.